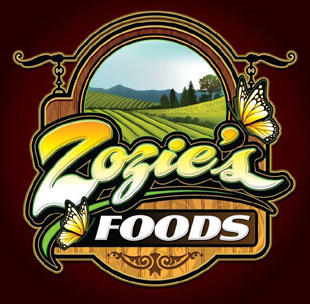 Created for Sign Artists, with the look of hand lettering. Casual , decorative and script fonts designed specifically for Sign Design. Improve your layouts and set them apart from the others. .
Orders processed through PayPal, the World's most trusted Online Security Payment System. Order today and receive by Email within 2 to 24 hrs. Or print and mail our ORDER FORM. A&S Truckin. Bold Headline Text with just a touch of Old School charm. 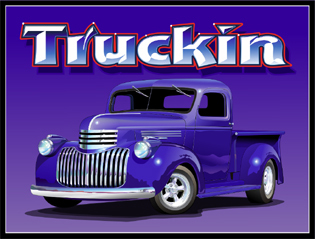 Truckin comes with 5 fonts. Four weights to choose from. Regular, Expanded, Thick n Thin and Lite, with a Chisel for the Expanded font. A&S Carolina. Classic Tuscan round with four versions. Bold, medium, light and extra ornamental light. 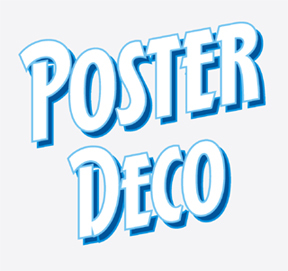 A&S Poster Deco. '30's - '40's gothic, stylish and stoic, Poster Deco come with a bold version, stylistic alternates and ligatures in both versions. A&S Bogie. A uniform stroke script font in the style of the old Speedball "B" round pen. ArtType Extra swash ending. 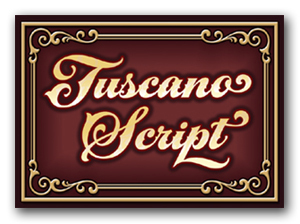 A&S Tuscano Script. Bold, spurred, ornamental script with many alternates and the signfonts standard ArtType Extra swash endings. 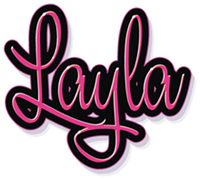 A&S Layla. Just right script with a personal touch. Two version that work together to create many unique combinations for your layouts and designs. A&S Jillbeans. A casual slab serif with lots of character. Based on a hand lettered style by sign artist Jill Welsh. Two font set includes regular and bold. A&S Stockyard. Extra bold Western/Victorian style alphabet. Finally, an alternative to Saloon, Thunderbird and Barnum. Full punctuation, numbers and accented character sets. A&S Heartbeat Script. Thin flowing script with a real hand painted swing. Two font set includes swash alphabet for all upper and lowercase letters. Numbers, full punctuation and accented character sets. A&S Ace High. Ornamental turn-of-the-century style type face. 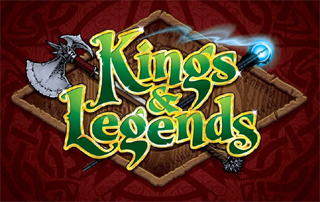 Two font set also includes Ace High Deuce. A&S Gingerbread. 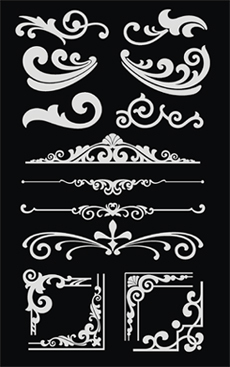 Scrolls, Lines, Corners and elements for creating your own panels and borders.78 elements in all. I learned the old school from my father. Hand lettering and many of the old ways. You have no idea how wonderful it is to finally have a set of fonts for the computer that captures the flavour of the brush stroke. It's almost like coming home when I use them. First of its Kind.... Four part Beveled Font, also includes a Chiseled version. 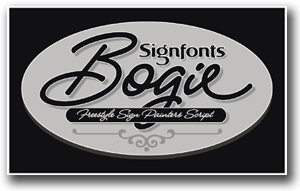 Only from Signfonts.com! A&S Cricket Chisel. A bouncy splash alphabet, great for informal shocards and sign design. 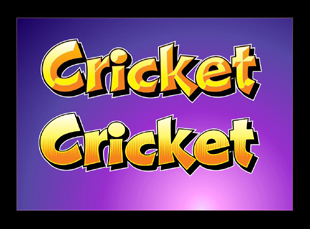 Cricket is now a five font set includes a chisel, fade and outline/dropshade. Now you can get the beautiful effects of Chisel Window Splash lettering with three font layers. Available only as open type font, compatible with mac and windows using most contemporary design and sign making software. A&S Motherlode Plus. The new Motherlode 2.0 has many new stylistic ligatures and additional alternate characters to enhance sign design. 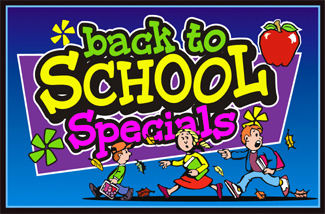 New Release Special Offer. 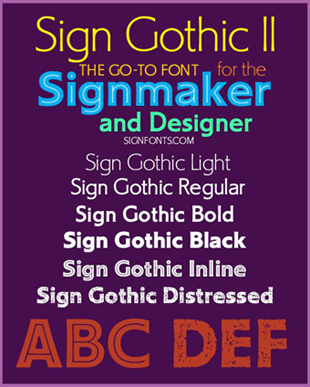 One of our originals, Sign Gothic has been re-created with new kerning and extended character sets. Four weights, Light, Regular, Bold and Black, with a Distressed and Inline version. Also an inline inset font that layers on top of the Black font for easy color changes. 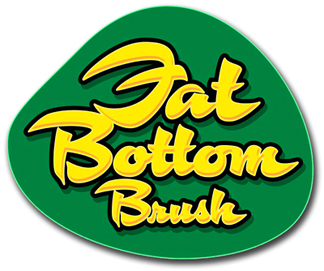 A&S Fat Bottom Brush. Here's a nice bold script for headline or primary copy. Lot's of flair without the frills. Automatic swash endings, many auto ligatures and alternates available with applications supporting open type features. A&S Argentina. 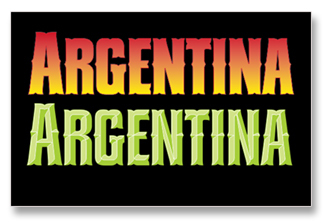 A simple stovepipe small caps typeface with a certain Latin flair. Chisel version is included for optional dimensional effect. A&S Cardiak. Contemporary style script with extensive automatic ligatures to give a truly hand lettered look in supported applications. 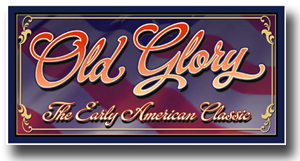 A&S Old Glory. Old fashioned style script in regular and heavy face with an additional swash underline font. Some automatic ligatures are included in both regular and heave face. A&S Raptor Chisel. Three part font includes base font, chisel and small caps. Numbers and accented characters also included. A&S Valentino Script is a light, loose script good for informal show card work as well as sign design. This script comes with a complete swash ending version for lower case letters. A&S Xtreme Script is a 2 font set. It has a swash alphabet with endings for all lower case letters and alternate characters for most capitals. This font was inspired by the logo on the '94 Yamaha Wave Blaster. A&S Omni Chisel. Two part chisel font, semi-connected racing alphabet. 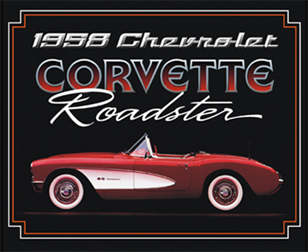 "Corvette" is Edoras and "Roadster" is Valentino Script. A&S Jiggy Roman, bouncy shocard style font. 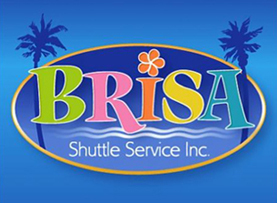 "Shuttle Service" is Sign Gothic. 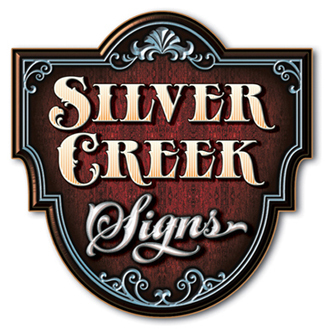 Sign design by Richard Blanco at BladeGraphics, Palm Beach Gardens, FL. A&S Edoras Chisel, part of the Edoras font group, includes 4 part bevel and and 2 part chisel effects. 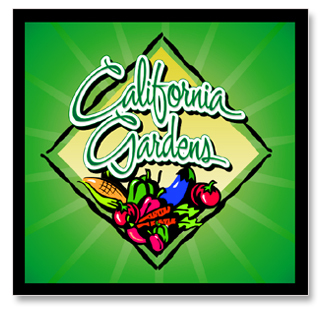 See the tutorial on Beveled Fonts and Fountain Fills. 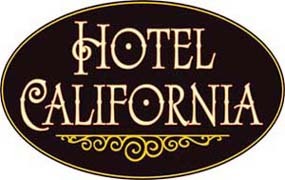 A&S Sarsaparilla is a light, period font with four alternate alphabets. Various decorative versions that will mix and match to suite you particular preference. A&S Easy Street. Light weight casual script with extensive stylistic ligatures and swash endings. Swash ending and ligatures are automatic in all programs that support Open Type features, such as Adobe Illustrator, Corel x6 and Photoshop. Swash ending work when typing space after each word. A&S Speedway. Sleek and racy hand lettered script with 13 swash endings. Great race car script or anywhere a readable script is needed. 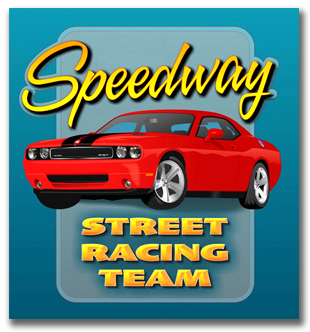 "STREET RACING TEAM" is Truckin Ext Chisel. 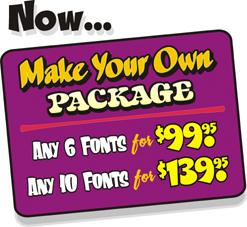 Speedway panel design by Moody Day, Day Sign Co.
A&S Happy Jack is a cartoon style shocard font, playful and bold. 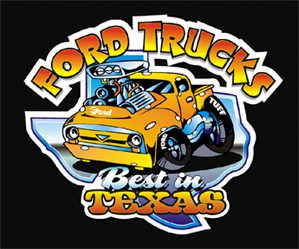 'Best in' is Motherlode and 'TEXAS' is Porkchop Primitive. Clip art truck from the Vehicles Collection at the Toon Factory. Art&Sign studio....5138 Jacksboro Hwy........Ft. Worth, Tx. 76114..
(c) 2001-2017 Art&Sign, All rights reserved. (c) 2001-2017 SIGNFONTS.All rights reserved.